The recent Austin thunderstorms caused havoc to both people and animals alike. My dog got trapped because of the storms. About a year ago Doug had it with the dogs. They were stealing things and taking them under our bed to chew. After finding the umpteenth destroyed wallet under the bed, Doug decided that he would make the bed off limits. He bought plastic storage drawers for under the bed, and lined each side of the bed with them. However, they did not meet in the middle of the bed, leaving a small gap if one of the dogs crawled under the low footboard. Doug propped a piece of wood against the footboard to keep them from crawling under there. This seemed to do the trick. One thing you need to know about Allegra is that she is scared of loud noises. She’s pretty brave and fairly curious about everything – it’s the border collie in her – but she doesn’t like BOOMS. On the 4th of July and New Year’s Eve, when neighborhood kids are shooting off fireworks, she quivers, shakes and turns to Jell-O. We’ll put her in the bed, under the covers, between us, and you can feel her heart racing as fast as a hummingbird. Nothing seems to calm her down. Thunder also sends her into a tizzy, but really we don’t have a lot of major thunderstorms in central Texas, that is until recently. We’ve probably had as many the past two weeks as we’ve had the entire five years of Allegra’s life. 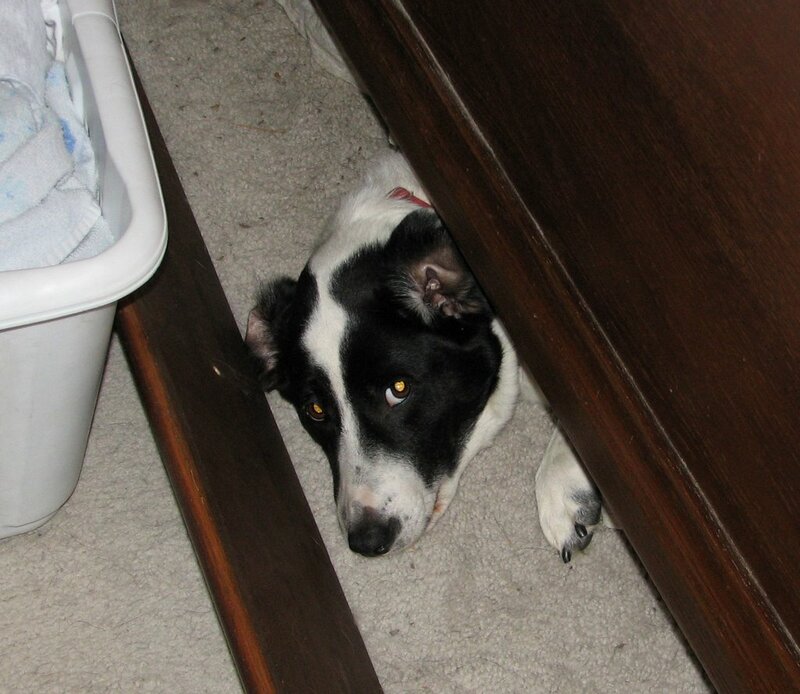 During the recent bout of storms, Allegra was determined that she was going to hide under the bed at night, to feel safe. At first, she just pushed aside the storage drawers and crawled between them, but that didn’t leave much space for her. Then she figured out how to move the board propped against the footboard. She could knock it down with her paw and crawl in, with plenty of room to maneuver. Given that she was so scared of the storms, we allowed her to do this until she decided that this was her place to sleep and would move the board even on nights without storms. This got a bit much. One night I decided I would break her of the habit and put a laundry basket next to the board. This way she couldn’t knock down the board, or so I thought. The next morning I woke without the usual nose sniffing my face to see if I was awake. Allegra did not come around for a morning pet and it was a bit quiet, so I knew something was up. When I went to the bathroom, I saw it – the board was moved about a foot and Allegra’s head was peaking out. “Hey Doug, I think Allegra’s trapped under the bed,” I said to the sleeping figure next to me as I crawled back into bed. “I doubt it,” he mumbled. By this time, Dante was awake and decided he needed petting, so he jumped on the bed and landed between us. Surely Allegra would be up shortly, if she could make it. After 10 minutes, no Allegra, so I had to see if she was really trapped. I got out of bed. “Dante, you want a treat?” I said as I went to the kitchen. Dante was behind me in a flash. I grabbed a handful of treats and went back to the bedroom where Allegra could watch what I was doing. Seeing the treats, she flopped around like a fish, but couldn’t dislodge herself. “Doug, she really is trapped,” I laughed. Doug finally woke up enough to get interested and peeks at Allegra. “Dante, sit; now speak!” I commanded. He sat, but Dante never barks on command, despite my best efforts to train him. “Speak!” A loud bark comes from the bed. It’s Allegra. She is showing me that she can speak even when trapped, and deserves a treat. “Dante, want a treat?” I ask, tossing him one. “Dante, come here,” I say, moving a few steps back. He follows. “Bark!” I hear Allegra under the bed, desperately trying to gain my attention. She wants out and she wants a treat. I giggle. I keep tormenting her for a couple of minutes, teasing her by giving her bother treats, thinking that she will manage to somehow crawl out, but she can’t. I am laughing and get Doug to take some photos. Finally, Doug has had enough and moves the board so Allegra can crawl out. She rushes to me and stares until I give her a treat. Silly girl still hasn’t learned not to crawl under the bed, but now she waits until the thunder is really bad.